So, for the past month or so I was knitting away on a cabled orange sweater for Rhinebeck. I’m happy to report that it got finished well in time for Rhinebeck, though in a fantastic piece of irony the Saturday of Rhinebeck ended up being far too warm to really get away with wearing sweaters, so finishing well ahead of time was all beside the point. No matter, though, because now we’re settling into the cool months and I fully intend to spend a lot of time wearing this cardigan this season. This is named for the ‘Jurisfiction’ crime solving agency of the literary world featured in the ‘Eyre Affair’ series of novels written by Jasper Fforde. There’s a fabulous line in the second book when the intrepid heroine Thursday Next visits Jurisfiction for the first time, and the Cheshire Cat greets her by saying, “Welcome to Jurisfiction…everyone here is quite mad.” And you know, that’s pretty much how I feel about knitting world a lot of the time, so I think it fits. Also Thursday Next pretty much does everything you could possibly do as a literary lead character (solving crimes, finding her kidnapped husband, changing storylines from inside literature itself, counselling co-workers who track down vampires for a living, occasionally time-travelling, you know – the usual), so I figure if anybody needs a nice cabled cardigan it’s her. This is a classic style cardigan worked from the bottom up, in pieces, then seamed before working the button-band and collar. It uses Cascade 220 Heathers (or your preferred worsted weight wool), and presumes a stockinette gauge of 18 sts/4 ins on 4.5mm needles. It’s meant to be a comfortable cardigan so positive ease is recommended, between 2-4 ins of positive ease depending on just how slouchy you’d like. The ribbing and cables on the sleeves maintain some of the simpler motifs used at the sides of the body, making for a nice fit throughout. The standouts, though, are the paired twining cables featured on the back and fronts. 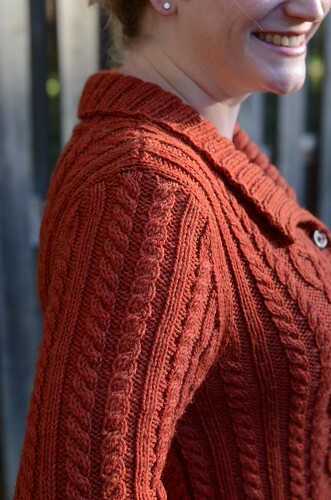 I don’t always say this, but this cardigan was an easy design from start to finish. The cables were a pleasant combination and after having the concept in my head since last winter, it was extremely satisfying to just sit down and knit the darned thing. I’m sort of sad that I don’t get to knit it anymore, actually, which is also partly due to the colour – I could really get into reddish orange, now that I’ve started trying it out! Jurisfiction is available in my Ravelry pattern store and on Patternfish for $7.00, and takes between 6-10 skeins of Cascade 220 (or comparable yardage of your preferred worsted wool) depending on size; it is written for seven sizes, for a finished bust sizes 34(37, 41, 44, 48, 51, 55) ins around when worn closed. Enjoy, enjoy! And I hope whereever you are this weekend (and coming week) is cozy, dry, and has some knitting in it. Must. Knit…as soon as I have all of my Holiday Knitting finished. Grrrr. Awesome cardigan. I LOVE those fancy cables, and the cables working perfectly out of the ribbing is the sort of thing that makes this knitter giddy! Congrats on another terrific design. Absolutely love that color. I am going to have to knit a sweater after the holidays(busy knitting gifts) and I think that orange color is calling me. What a gorgeous piece of knitting! I love the cables, and am rather giddy at seeing all the close up shots. Not good to drool all over one’s keyboard! Beautiful sweater! Hope Sandy doesn’t do a number on you. I’m listening to some pretty intense wind and rain here near the Chesapeake Bay, and getting some knitting done myself! 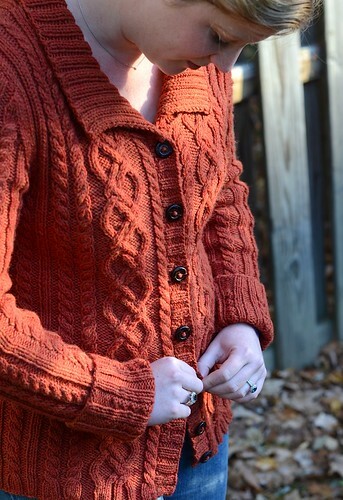 Lovely cardigan! Also, I love hearing of someone else who likes Thursday Next!! Ah! Another Fforde ffan! 😀 It took a minute for the name to sink in, but it did by the end of the first paragraph. It is a *gorgeous* sweater — nicely done. And yes — if anyone needs a comfy, warm cardigan, it would be Thursday. I so have to finish what I’m working on so I can tackle some cables…. This is gorgeous and quite Thursday-ish. 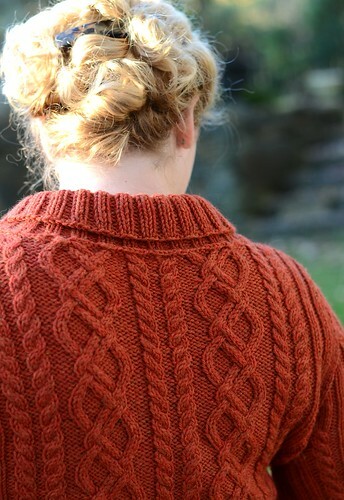 I’m definitely looking forward to knitting it….and then wearing it while I get lost in a good book. It is lovely! You definitely need pictures of yourself in your sweaters! I love those cables, they are so interesting! What a lovely sweater! I love all the details…all that cabling! You are so talented. Beautiful! I look forward to knitting it! Lovely. You have such a talent for cables–and for sewing up tidily. What’s your view on orange? Can anyone wear it if it’s the right shade, or should some people ( like me?) leave well enough alone? Well that is a good question! I had not tried knitting with orange until this year because I generally avoid “rusty” colours. But like any other hue, there are variations, and I tried an orange that was on the red side rather than yellow, because I do enjoy reds. So I would try the shade that is closer to the familiar side, if it’s a colour you haven’t tried before. OH, I really love it!! 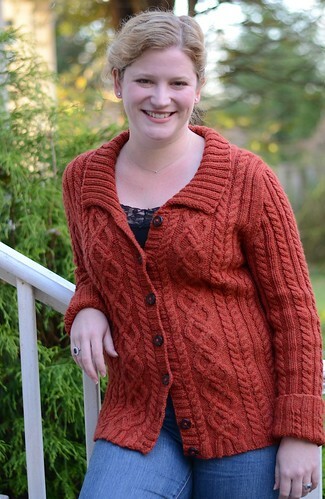 Kudos Glenna – that’s an awesome cardi! Cute! I love the texture and colour. Queued! Wow!! Gorgeous sweater! I might have to add this to my bucket list of projects. Right now it would be way too ambitious for me. Love the sweater and as a FForde ffan I’m of course obliged to make it. We should tell him about it, I bet he’d get a kick out of you designing a sweater for Thursday Next. Lovely – great design and color. It’s going in my queue immediately. Bought yarn at SAFF this weekend for a cabled sweater. I saw this pattern when I got home and it immediately replaced my planned pattern. It’s on the needles now with a natural variegated colorway and the cables are showing up well. Oh gosh, it’s lovely! And Cascade 220 is one of my favorite yarns. Beautiful! I love it. And thanks so much for the Jasper Fforde tie-in. I love his Thursday Next books to bits! Beautiful! 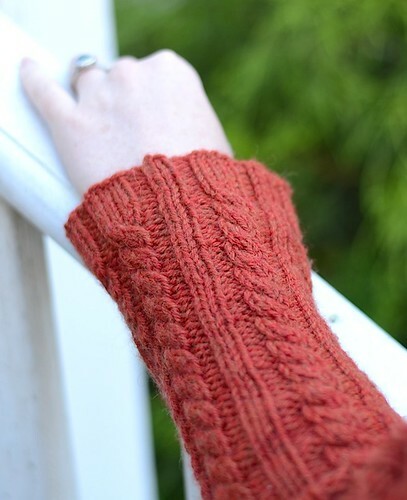 I’ve been itching to do some cables ever since you gave us a sneak peek earlier. It’s in my queue, as well! how do you get your seams to look so lovely? mine always end up a little gappy and then i want to re-do them (but i never do). Very nice orange sweater. I knitted a sweater for my 3 years old son. Knitted with orange color Kauni yarn. At the moment i dont have picture of it. Soon will add and show you too. What a lovely cardigan. I really like the style, especially the neckline and collar. It really frames the face and upper neckline.